Miele vs. Dyson — whether you’re considering uprights, sticks, canisters or robots, both of these brands have many options to fit the bill ranging in price and features. This head-to-head match-up will walk through each brand considering design, cleaning capabilities, usability, price, value, maintenance, and more. The name Miele has been around for over 100 years, making its big debut in Germany with the cream separator (for dairy products). They later expanded into various home appliances and produced their first vacuum cleaners in 1927. Today, Miele manufactures canister vacuums, stick vacuums, upright vacuums, and robot vacuums. They offer bagged or bagless models and an assortment of varying features, depending on the model. In the 2016, they generated $4.6 billion in revenue. Dyson, although quite well known across the vacuum market, was founded just in 1987 and started out in the shed of James Dyson where he developed 5,127 prototypes between 1979 and 1984. Determined to develop a vacuum that wouldn’t lose suction. Dyson based all of his designs on a cyclonic suction model, inspired by the coating system for spraying epoxy paint, at a company he worked with at the time. Today, Dyson has grown into a much larger company, producing uprights, sticks, handheld, and robot vacuums. In 2016, they generated 2.5 billion in revenue. Cordless vacuums are increasing in popularity, as fast-paced lives increase the need for easy and quick cleaning. Both Miele and Dyson offer cordless models, although Dyson really does take the cake here. Miele’s only cordless vacuum is a robot vacuum, the Scout RX1. On the other side of the table, we have Dyson cordless vacuums, which includes a large collection of cordless stick vacuums, as well as one robot vacuum—the Dyson 360 Eye. Height 50.6" 49.2" 21.8" 49" 49" 47.5"
Width 9.8" 9.8" 6.5" 9.8" 9.8" 9.8"
Depth 10.3" 10.1" 6.5" 8.8" 8.2" 8.2"
Weight 6.68 lbs. 5.9 lbs. 9.7 lbs. 5.75 lbs. 5.45 lbs. 4.5 lbs. The Dyson V11 launched March, 2019. It is the most advanced cordless vacuum Dyson has ever built. It offers an impressive 60 minute run time and up to 185 AW of suction power. Additionally, it uses intelligent suction and an LCD screen on the rear of the unit to change modes and monitor remaining cleaning time. Intelligent suction. Dynamic increases / decreases suction depending on what is required to clean your floors. LCD on the rear of the unit allows you to watch maintenance videos, monitor remaining cleaning time, and also change cleaning modes. The Dyson V10 is one of the most powerful cordless stick vacuum released by Dyson. It offers an extended 60-minute run time, larger dust bin capacity, and an advanced battery that is said to last up to 15 years. Combining the upgraded battery with the lifetime washable filter included, this vacuum has zero annual maintenance costs. Extended 60-minute run time offers plenty of time to clean homes of any size. Advanced dust bin design makes it easier to empty with a “Point-and-Shoot” approach. 2-in-1 design allows the vacuum to be a powerful stick vacuum or portable handheld. One of the most expensive models of cordless stick vacuums on the market today. Slightly heavier than comparable cordless sticks, coming in at 5.8 lbs. The Miele Swing H1 is a corded stick vacuum that is a lighter compared to traditional upright vacuums. The Swing H1 uses a 2.5 L capacity dust bag and serves the purpose of a 2-in-1, meaning that it can be used an upright or a handheld. It comes with two accessories, a crevice tool and an upholstery tool, that can be attached when in handheld mode. It’s use of high-dollar filters and disposable dust bags do equate to a high annual maintenance costs, but for some users looking for corded power, it may still be a solid option. XL dust bag capacity at 2.5 liters, twice that of any of the Dyson cordless models. 28′ cleaning radius still provides a large degree of flexibility when cleaning your home. At 9.7 lbs, it’s almost twice the weight of the Dyson stick vacuums. Dust bags and filters equate to higher annual maintenance costs. The cord could get in the way of ultimate cleaning freedom. The Dyson V8 is a cordless stick vacuum that has a slightly diminished run time compared to the Dyson V10 stick. The V8 can run for up to 40 minutes and easily converts between a stick vacuum and a portable handheld. The included attachments can be used with the stick or with the handheld setup. The 40-minute run time is still longer than most comparable cordless stick vacuums on the market. Excellent cleaning performance (captured 95% of debris during our 4-debris cleaning test). 2-in-1 capability makes the V8 more versatile than stand-alone models. One of the more expensive models on the market today. Smaller dust bin capacity compared to the Dyson V10. Does not stand upright on its own (use wall mount or lean it). The Dyson V7 model is older than the V8 and V10 models. It also has a shorter run time, maxing out at around 30 minutes (in regular cleaning mode), but still offers great cleaning performance. The biggest issue with the V7 is the cleaning performance of large debris. However, you will find better large debris performance if you get a V7 model that includes the soft roller cleaning head (ex. 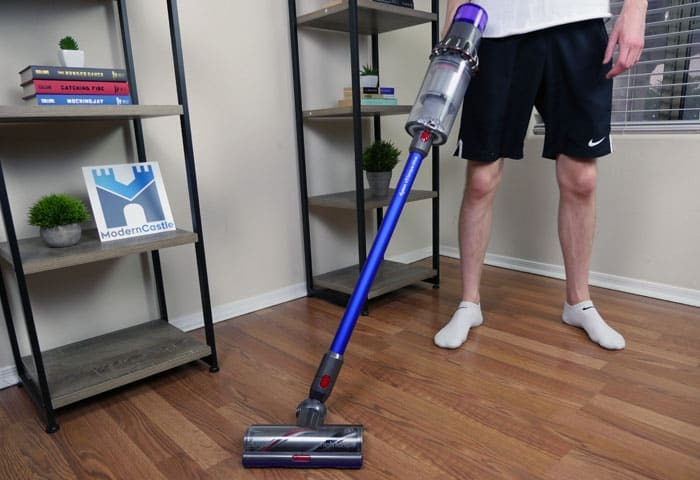 V7 Absolute).RELATED – If you like the idea of a stick vacuum, but just want something less expensive see our Electrolux Ergorapidoand Bissell Bolt reviews. It excelled at cleaning small debris during our sugar and kitty litter test. Similar to the other Dyson V-series models, the V7 can convert between an upright stick vacuum and a portable handheld. The 30-minute run time should still be sufficient for most areas. Low annual maintenance costs make it easy to keep it running smoother for longer. 2-in-1 design is great for versatility, acting as an upright and handheld model. Same 100AW max suction as the (less expensive) V6 model. Small dust bin at 0.4 L max capacity. 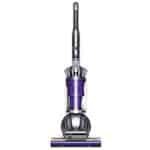 The Dyson V6 model is the least expensive model in the V-series with similar features of the more expensive models. The V6 is still a 2-in-1, easily converting from a stick vacuum to a handheld. It has a relatively short max run time of 20 minutes (at standard power) and only six minutes at max power. RELATED – Need a standalone handheld? See our best handheld vacuums or check out the Dyson V6 Trigger. That being said, the cleaning performance for small debris is still good and certainly worth considering. Least expensive price tag of all the Dyson V-series cordless stick models. Same 100AW max suction as the Dyson V7 (which is a more expensive model). Very lightweight unit, at 5.1 pounds. Poor cleaning performance of large debris. Relatively short overall run time of only 20 minutes. Smaller than average dust bin with only a 0.4 L capacity. If you’re in the market for cordless stick vacuums, Dyson has the playing field pretty well covered, but that’s not to say that Miele is down and out. Miele’s comparable stick vacuum, the Miele Swing H1 stick vacuum, is a lightweight, corded option that may still be worth a look. The designs of these two vacuums are notably different. The Miele Swing H1 conceals all working parts of the vacuum with a shiny exterior. The vacuum uses a disposable dust bag and a concealed brushroll cleaning head. On the other side of the spectrum, the Dyson V10 takes a more transparent approach. You can see all working parts, including the filtration, cyclones, dust bin, and even the majority of the cleaning head. This make it easier to identify the problem in the event of troubleshooting. The Miele Swing H1 comes with two simple on-board accessories, a crevice tool and an upholstery tool. The Dyson V10 comes with a wall mount / docking station, two cleaning heads (one for bare floors and one for carpet), a combination tool, crevice tool, soft dusting brush, and a mini-motorized tool. The Miele Swing H1 Quick Step is a corded stick vacuum that uses a bagged canister and has a 2-in-1 design. There are two speed options and it comes with two on-board tools—the crevice tool and an upholstery brush. In addition, it comes with a filter, but when it’s time to replace the filter, it’ll cost you a bit. The Dyson Cyclone V10 is a stick vacuum that also works as portable handheld. The V10 has approximately a 60-minute run time and uses a lifetime-washable filter. The Dyson comes with a variety of accessories and attachments. And the battery will reportedly last 15 years. Outside of the cordless market, we have upright vacuum cleaners. Both Miele and Dyson manufacture a number of upright models, each varying in features, price, and power. The table below outlines some of the most popular models from each brand. Height 42.1" 46.5" 41.9" 46" 31.7" (compressed) 46.5" 43.3"
Width 15.3" 14.4" 15.6" 14" 14.1" 14.4" 17.2"
Depth 13.4" 13.4" 13.4" 10" 11" 13.4" 13.4"
Weight 17.35 lbs. 21.4 lbs. 15.6 lbs. 20 lbs. 12.15 lbs. 21.4 lbs. 19.0 lbs. The Dyson Ball Animal 2 is a powerful option for an upright vacuum. It features an XL dust bin capacity, holding over 2 L of dirt, dust, and debris. It is lighter than the Miele Dynamic U1 Jazz by over 4 pounds. In addition, this vacuum includes a wide range of accessories. It has a lifetime washable filter, a turbine brush tool for cleaning pet hair off of upholstery, a combination tool, tool for reaching high areas, and a stair tool. It uses the Dyson Ball design for great swivel steering and maneuverability. XL dust bin capacity stores over 2 liters of dirt, dust, and debris. Lifetime washable filter means lower maintenance costs overall. Doesn’t convert to a handheld like the Dyson V-series stick vacuums do. The Miele Dynamic U1 Jazz upright vacuum is a 22-pound upright with a bagged-system for debris collection. The bag does help limit the release of allergens and other particulate, but it also increases maintenance costs and is another step you have to consider when using this vacuum. The U1 Jazz does have an on and off switch for the brushroll as well as a full bin indicator when it’s time to change the bag. Bagged system may be better for people who suffer from allergies. Automatically adjusts to different level floor height. Swivels at the neck and can lean back quite far, making it easier to vacuum under furniture or beds. Bagged system also means more maintenance and added costs. Less easy to maneuver compared to Dyson Ball models. The Dyson Multi Floor 2 upright vacuum is designed for tackling spaces with a variety of floor types. It automatically adjusts to accommodate different flooring from bare concrete to area rugs and high pile carpet. It has some trademark Dyson features like its cyclone suction technology, washable lifetime filter, and Dyson Ball swivel steering. Accessories include the high reach wand, washable lifetime filter, stair tool, and combination too, similar to the parts of the Dyson Animal 2 upright model. Designed to adjust for multiple flooring surfaces in a home. Large dust bin capacity at just over 1.5 liters. Six pounds lighter than the Miele Dynamic U1 Jazz. Only a 30′ cord compared to Miele’s 40′ cord. Older style technique for emptying the dust bin, less hygienic. The Dyson Multi-Floor upright also comes in a canister model, with a different body style, but similar features. This head-to-head match up is going to pair the Miele Blizzard CX1 Electro vs. the Dyson Multi-Floor Canister. Both of these are bagless, corded models. Read below for the full breakdown of some of the most important features on each model. Both the Miele and the Dyson have lifetime HEPA filters for collecting even the smallest of particles. Neither of these filters need to be replaced throughout the lifetime of these vacuums. The dust bins for the Miele Blizzard CX1 Electro and Dyson Multi-Floor are also pretty similar. The Miele has a dust bin release at the bottom of the canister that opens the latch and releases the dust bin door, allowing debris to fall into a trash can below. The Dyson does put a little more space between the debris and the user, by having the release button be at the top of the canister, versus the bottom. It’s a small thing, but it is a little more hygienic when it’s time to empty the can. The Miele Blizzard has four different levels of suction control. By comparison, the Dyson Multi-Floor automatically selects the appropriate suction for each floor type. The Miele Blizzard Electro comes with an upholstery tool and crevice tool, integrated into the back of the vacuum, as well as a separate dusting brush. The Dyson Multi-Floor canister comes with a stair tool and combination tool (dusting and crevice tool). If you register your vacuum at Dyson.com during check out, you also get three additional cleaning tools at no cost. You can pick from a soft dusting brush, carbon fiber soft dusting brush, reach-under tool, multi-angle brush, dirt brush, articulating hard floor tool, mattress tool, or even a pet grooming tool. The Miele Blizzard canister vacuum is a corded, bagless canister vacuum. It includes an added feature of an automatic cord rewind and manual suction control. The Dyson Multi-Floor canister vacuum is also a corded, bagless canister vacuum. It automatically adjusts suction for each flooring type and comes with a larger selection of accessories and cleaning tools (when purchased from Dyson.com). The Miele Dynamic U1 Maverick comes in at a lower price than the Miele U1 Jazz, but also has a couple different features. Compared to the Jazz, the Maverick lacks a true HEPA filter (but does have a standard filter) as well as lacks LED headlights. Both models operate at 1200W suction with a rotary dial for suction control. The Maverick includes a wand, dusting brush, upholstery tool, and crevice tool. Lower price tag over the Miele U1 Jazz. Offers the same 1200W suction as the Miele U1 Jazz. Bagged system can be beneficial for allergy sufferers. No HEPA filtration for capturing ultra fine particulate. No LED headlamps (so no pitch black night time cleanings). Bagged system means more maintenance and higher annual costs. The Dyson Small Ball upright vacuum is a compact upright that comes with a telescoping handle and wand. This allows the vacuum to compact itself in order to store in small space or carry easily. The Dyson Ball is smaller than other full-size models, but what it lacks in size it makes up for in maneuverability. RELATED – See our full review of the Dyson Small Ball (DC50) here. Compact design (at just over 12 lbs.) makes this model more compact and easier to maneuver. Bagless design with a lifetime washable filter means lower annual maintenance costs. Smaller size equates to smaller dust bin capacity, maxing out at 0.8 liters. Older style dust bin makes it difficult and a little awkward to empty when it’s full. The Miele Dynamic U1 Cat & Dog upright vacuum cleaner has a similar body style to the U1 Jazz and U1 Maverick. It offers the same 1200W suction, LED headlamps, and Miele’s Active AirClean HEPA filtration. It is recommended by Miele by tackle pet hair on hard floors, low pile, or high pile carpet. The Miele U1 Cat & Dog is a bagged system and comes with a dust bag indicator to know when it’s time to replace. This model is designed for homes with pets and comes with a 15″ extended wand, dusting tool, upholstery tool, and the mini-motorized brush tool. HEPA filtration helps to capture even ultra-fine particulate. Includes extra accessories for cleaning up after pets. Same 1200W suction as the other Miele U1 series models. At 21.4 lbs., this model is heavier than comparable Dyson uprights. Handle controls needed for when changing flooring types. As a bagged system, there are higher maintenance costs associated. For the best vacuum for pets by Miele and Dyson, there are two models that stand out in front of the pack: the Dyson Animal 2 and the Miele U1 Cat & Dog. Both of these are powerful uprights that offer many features for pet owners and advanced systems designed to tackle pet hair better. But are they really the cat’s meow? Find out below. The Dyson Animal has a smaller body style than the Miele U1 Cat & Dog. Overall the Animal 2 is about 4.5″ shorter and weighs about 4 pounds lighter. Width and depth are comparable between the two models. TRANSPARENCY | As general design approaches, the Dyson Animal is more transparent, versus the Miele which takes a sleeker and somewhat reserved approach. On the Dyson, you can see all of the main parts of the vacuum, including the dust capacity, filters, and suction system. Even the brushroll has a clear window at the top to see what’s going on. Comparably, Miele’s approach is built more like a tank. It has a clean look, but conceals all parts, accessories, and even uses a bag versus a clear dust bin. While this doesn’t directly affect cleaning performance, it may make maintenance slightly more difficult on the Miele just for the sole fact that you can’t see what’s going on. For cleaning pet hair, both vacuums have features that make it aeasier. First off, both models include mini-motorized pet brushes. These work well for cleaning pet hair off of beds or upholstery. Second, let’s talk about filters. The Miele U1 Cat and Dog comes with an Active AirClean filter, which includes an odor shield for masking pet odors. While there is no HEPA filter, there is an option to add one. The Dyson Animal 2 comes with a lifetime, washable HEPA filter, but doesn’t have odor-blocking. But, with proper maintenance, you won’t ever have to replace that filter, whereas the Miele Active AirClean filter is an added cost. The Miele Dynamic U1 Cat & Dog is a bagged upright that conceals the mess, for a simple aesthetic and modern form. The bagged unit can be good for minimizing allergens and finite pet dander from spreading, but it also incurs additional maintenance costs over the Dyson Animal 2. In addition, the Cat & Dog does not include a traditional HEPA filter and is a larger / heavier model. The Dyson Animal 2 is a bagless upright that uses transparency to show exactly what is going on and how it cleans. Naturally, this clear design makes it a little easier to know what happened when things go awry as well as being able to easily see when the dust bin is full. The Dyson Animal 2 includes a lifetime washable HEPA filter and is a smaller / lighter model. Miele and Dyson each currently manufacture one robot vacuum model. Their models are both designed to be wireless controlled, Dyson using wifi-connectivity and smartphone connection, while Miele uses a remote control. Read below to find out the specifics of each model and see how they compare. The Miele Scout RX1 is a cordless robot vacuum that uses infrared technology to navigate around your home, identifying messes and obstacles. The Miele Scout has a central brushroll and two spinning side brushes to help capture debris along edges and in corners. When the battery is low, it uses that same infrared technology to “drive” itself back to the charging station where it can juice up, in preparation for its next cleaning cycle. The Scout RX1 comes with a remote control that you can use to start, pause, cancel, or schedule a cleaning cycle at any time. Muliple cleaning modes with a remote control for easy usability. Infrared navigation helps the vacuum to navigate smarter around the space. Limited online reviews lead to questions regarding cleaning performance and overall quality. Vague product description of feature like “non stop power” and “triple cleaning performance”. The Dyson 360 Eye is a robot vacuum that is designed with Dyson’s patented cyclone suction system in a new autonomous body style. The 360 eye uses a central camera to navigate around the space. There are eight cyclones (compared to the 14 or 15 cylinder cordless stick models from the V-series) which can capture particles down to 0.5 microns—smaller than the width of a human hair. In addition, the 360 has wifi connectivity, and can be controlled with your smartphone. Using the Dyson app, you can start, stop, schedule, or track cleaning cycles at the push of a button. Smart navigation with an on-board camera. Wifi-connectivity and can be controlled via your smartphone. Slightly smaller dust bin capacity (0.33 L) considering its larger body style. Significantly higher price tag than most other options on the market. Looking for this best vacuum for hardwood floors? This head-to-head comparison is going to look at Miele vs. Dyson for hardwoods. Here at Modern Castle, we are firm believers that the best way to know how well a vacuum cleans a particular flooring type is to put it to the test. For hardwoods, we tested the Miele Compact C1 canister vacuum vs. the Dyson V8 cordless stick vacuum. Let’s see how they compare. Considering body style, these vacuums are significantly different. The Miele C1 is a corded, bagged canister vacuum while the Dyson V8 is a cordless, bagless, stick vacuum. Both are light in-hand to operate. The Miele Compact C1 has a wheeled base and a long hose with extension wand. The Dyson V8 has the dust bin, motor, and filter in-hand with the wand and cleaning head at the base. For cleaning tests, we use four different debris types to get a full assessment of how each vacuum performs. We use cereal, kitty litter, rice, and sugar. On hardwoods, the cleaning performance of the Miele Compact C1 is flawless… literally 100% of debris for all four tested was picked up. The Dyson V8 is 98% or above for the rice, kitty litter, and sugar test. 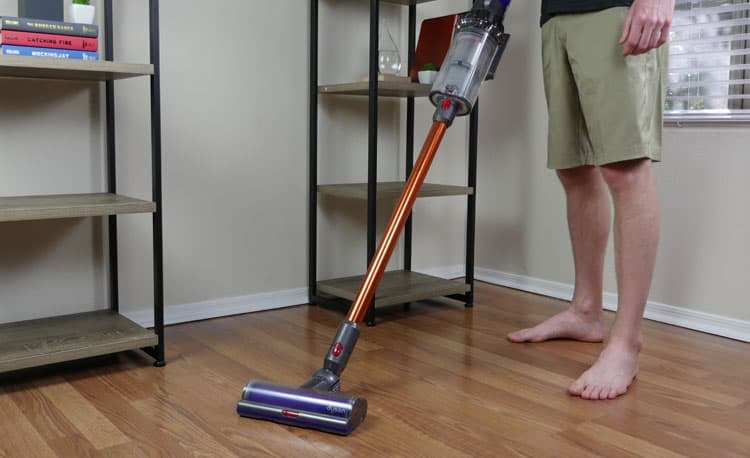 For nearly flawless (99%) cleaning performance on hardwoods by Dyson, be sure to check out the Dyson V10 cordless stick vacuum. 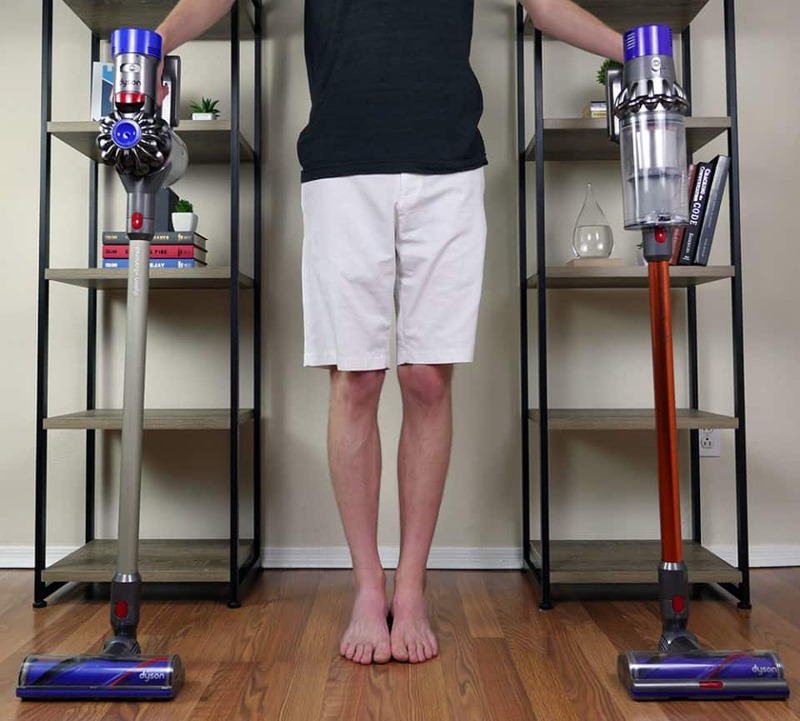 Also, see our Dyson V8 vs. V10 for a complete side-by-side comparison. HOW DOES IT WORK | The Miele comes with a Pure Suction Parquet cleaning head that allows it to create a strong suction against bare hardwood floors. The Dyson V8 uses either a Direct-Drive bristle-style brushroll or the Fluffy soft brushroll (only available on the Dyson V8 Absolute model). The Dyson V10 Absolute includes the Fluffy hardwood cleaning head on all models. This cleaning head does a better job at capturing large debris as well, compared to the Direct-Drive brushroll. The Miele Compact C1 canister vacuum has higher maintenance costs since it required a replacement bag and replacement filter. This vacuum is also much heavier (16 lbs. vs. the 5.75 lb cordless Dyson V8). But all that being said, the cleaning performance of the Miele C1 on hardwoods is flawless. The Dyson V8 stick vacuum has lower maintenance costs since it uses a lifetime washable filter and a clean reusable dust bin. This vacuum is much lighter as well (5.75 lbs. vs. the 16 lb. Miele). The cleaning performance on hardwoods is 89% overall and 98% or higher for small debris like rice, kitty litter, and sugar. RELATED – What vacs do great on hardwoods? Find out in our best hardwood floor vacuums primer. What Types of Vacuum Does Miele & Dyson Have? So Miele vs. Dyson, which brand is right for you? Use the references below to sort through the most popular models from each brand, ranging in type, price, and features. Miele and Dyson both offer a wide selection of upright vacuums. Generally speaking, the Miele upright vacuums are a little larger and slightly heavier than the Dyson models. Upright Miele vacuums are all bagged models, while Dyson uprights are all bagless. MIELE DYNAMIC U1 JAZZ | The Miele Dynamic U1 Jazz upright vacuum offers 1200W suction power, HEPA filtration, LED headlamps, an extension wand, dusting brush, upholstery tool, and crevice tool. It is a bagged system that holds 5.16 liters of dust, dirt and debris. MIELE DYNAMIC U1 MAVERICK | The Miele Dynamic U1 Maverick is another bagged upright vacuum. It offers 1200W suction power and comes with a wand, upholstery tool, crevice tool, and a dusting brush. This model also comes with a full bag indicator so you know when it’s time to change bags. The Maverick comes with an AirClean filter and a 6 L capacity dust bag. MIELE DYNAMIC U1 CAT & DOG | This model was designed for homes with pets, and the people who live there. It is a bagged vacuum that includes the 1200W suction power, AirClean filter system, manually adjustable cleaning head for different floor heights, and a full indicator when the bag needs to be replaced. The bag can hold about 6 L of debris. The Cat & Dog includes a dusting brush, crevice tool, upholstery tool, and a mini-motorized pet tool. DYSON BALL ANIMAL 2 |The Dyson Animal 2 is a nice option for pet owners or homes with high-traffic. It includes a lifetime, washable filter, mini-motorized turbine tool, stair tool, and the combination tool. DYSON SMALL BALL | This upright model is three pounds lighter than the Dyson Multi-Floor, and nine pounds lighter than the Miele U1 uprights. It comes with a telescoping wand / handle that allows it to compact for easy storage and transportation. It includes a lifetime, washable filter, stair tool, combination tool, and self-adjusting cleaning head. Read our full review with cleaning tests of the Dyson Small Ball Animal Compact here. DYSON CINETIC BIG BALL | The Cinetic models is the one of the largest Dysons on the market today. It is filter-free and includes a redesigned dust bin that makes it easier (and more hygienic) to empty. The Dyson Cinetic includes a soft dusting brush, combination tool, multi-angle brush, stair tool, reach-under tool, mattress tool, and a tool bag to hold all of the accessories. This model was designed for allergy sufferers in mind. For stick vacuums, Dyson definitely has more balls on the court, offering four different models in the V-series lineup, with Miele only offering one model—the Swing H1 Quickstep. The Dyson stick vacuums are all cordless, while the Miele is a corded vacuum. MIELE SWING H1 | The Miele corded, bagged, stick vacuum. When empty, it has a full bag capacity of 2.5 L. It offers 1000W of suction power, the AirClean filter, and a set of on-board accessories, including an upholstery tool and crevice tool. There are two speed controls and is very lightweight, coming in around 9.7 pounds. 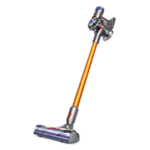 Dyson V11 | This is the highest performing cordless stick vacuum Dyson has ever built. It can generate up to 185 AW of suction power, while running for up to 1 hour (on eco-mode). Additionally, it’s arguably the smartest vacuum Dyson has ever built, with intelligent suction and an LCD on the rear of the unit to monitor progress. You can read our full Dyson V11 review here. DYSON CYCLONE V10 | It uses a 2,600 mAh battery that generates suction up to 140AW. With a full charge, this vacuum will run for a maximum of 60 minutes. The V10 Absolute comes with two cleaning heads (one for carpet and one for bare floors), a combination tool, crevice tool, dusting brush, and mini-motioned turbine tool. You can read our full Dyson V10 review here. DYSON V8 | The Dyson V8 was released right before the V10 and has a slightly shorter run time, of about 40 minutes. 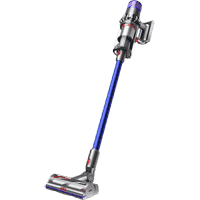 The V8, as with all of the Dyson V-series stick vacuums, can be used as a stick vacuum or a portable handheld. It offers 115AW suction power and a 0.54 L dust bin capacity. You can see our full Dyson V8 review here. DYSON V7 | The V7 model is one step below the V8 model. It offers a 30 minute run time with 100AW max suction. It comes with the combination tool and the crevice tool (could be more depending on the model you select). Of all the V-series stick vacuums, the V7 struggled the most with large debris on hardwoods. You can see our full Dyson V7 review here with complete cleaning tests. DYSON V6 | The V6 model is the most basic V-series model that is currently offered. It has the shortest run time of only 20 minutes, but also the lowest price point. The V6 offers the same level of max suction as the V7 and the same 2-in-1 design to run as a stick vacuum or a portable handheld. You can read our full Dyson V6 review here. Both Miele and Dyson have a pretty minimal robot vacuum selection, each company only offers one model. With Miele it’s the Scout RX1 and Dyson has the 360 Eye. Review of the RX1 raises a few questions and the exorbitant price tag of the Dyson 360 puts it a little out of reach for most users. Click here to check out our complete Robot Vacuum Reviews for tons of popular brands. DYSON 360 EYE | The 360 Eye is Dyson’s premier robot vacuum. It costs a pretty penny, but is the only robot vacuum on the market to use Dyson’s cyclone suction technology. The downside of this is the taller profile. The 360 Eye is 4.7″ tall which makes it difficult to squeeze under short furniture. But that aside, the Dyson 360 features smart navigation, wifi-connectivity, voice control, and a full-width brush bar for advanced cleaning performance. MIELE SCOUT RX1 | Miele’s robot vacuum boasts a 120 minute run time and offers features like smart infrared navigation, 4 cleaning modes and a remote control. Corner mode, spot mode, turbo (speed) mode, and auto mode allows you the option to truly customize your cleaning experience. The RX1 also can do scheduled cleaning, under the condition that all cleanings are scheduled for the same time each day. Lastly, this model uses a bristle style brushroll which could be a problem for homes with pets since pet hair is prone to tangle. Canister vacuums are the only vacuum model currently in which Miele offers a bagless option. The Blizzard canister vacuum is the bagless canister option, but comes in five different style. Dyson offer four canister vacuum models, all designed with Dyson’s Ball body style. Read below for more details on each canister vacuum. MIELE BLIZZARD CX1 SERIES | The Miele Blizzard CX1 series offers five different models that are basically the same except for cleaning heads and accessories. This vacuum has a retractable cord, a bagless design with an easy to empty dust bin, a lifetime filter, and on-board accessories. Accessories include a crevice tool, dusting brush, and upholstery tool. Miele Blizzard CX1 Pure Suction | Comes with a parquet cleaning head for hardwood flooring only and standard on-board accessories. Miele Blizzard CX1 TurboTeam | Comes with a rotating brushroll cleaning head, the parquet hardwood cleaning head, and standard on-board accessories. Miele Blizzard CX1 Electro | Comes with the electrobrush cleaning head for heavy-duty carpet cleaning and standard on-board accessories. Miele Blizzard CX1 Cat & Dog | Comes with the parquet hardwood cleaning head, the electrobrush cleaning head, standard on-board accessories, and a couple additional accessories including an upholstery tool, another crevice tool, and a the mini motorized pet brush. Miele Blizzard CX1 Home Care | Comes with the electrobrush cleaning head with added LED headlamps, the XL parquet hardwood cleaning head, flexible crevice tool, universal cleaning brush, and standard on-board accessories. DYSON BALL CANISTER VACUUMS | The Dyson Ball canister vacuums are a little different compared to the Miele canister vacuums. Dyson makes four different models, using two body style—the Big Ball or Standard Ball. In the Big Ball, there is the Cinetic, Musclehead, and Multi-Floor. In the Standard Ball (smaller size) there is only one model— the Dyson Ball Multi-Floor. Read below for details about each one. DYSON CINETIC BIG BALL ANIMAL | Comes with the turbine head cleaning tool, hose attachment, combination tool (crevice tool and dusting brush), stair tool, and a stiff brush for dried-in dirt. As an added feature, this model requires no filter and can right itself if it topples over. DYSON BIG BALL MUSCLEHEAD | Comes with the turbine head and musclehead cleaning head, with a slimmer profile than the standard cleaning head. Accessories include the combination tool (crevice tool and dusting brush) and a stair tool. Also comes with a lifetime washable filter. DYSON BIG BALL MULTI-FLOOR | Comes with the turbine cleaning head, the combination tool (crevice tool and dust brush) as well as a stair tool. The model introduces a newly designed dust bin that allows you to place the dust bin further into the trash can before releasing debris, which helps to make it cleaner and more hygienic. Also comes with a lifetime washable filter. DYSON SMALL BALL MULTI-FLOOR | Comes with a trigger head rotating brushroll, and two attachments—the combination tool (crevice tool and dusting brush) and a stair tool. Also comes with a lifetime washable filter. So…Which is Better? Miele or Dyson? So between Miele and Dyson is one definitively better than the other? Basically, no. Both brands offer their own distinct set of features and benefits, along with drawbacks. Depending on what exactly you’re looking for, Miele or Dyson could have the best option for you. So how do you choose between Miele vs. Dyson? Upright Vacuum – These models generally have the most suction power and on-board features. Likewise, they are also usually heavy and can be hard to maintain at times. 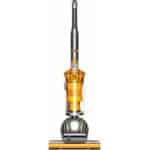 Stick Vacuum – Stick vacuums are used similarly to an upright, but they are significantly lighter, easier to maneuver. That being said, they also have smaller dust bins and may have less suction power. Robot Vacuum – Robot vacuums take the work right out vacuuming. Set it and forget it, these vacuums can run on their own, whether you’re home or not. Specifically considering Miele and Dyson, I have reservations about both of these models. If you’re hunting for robot vacuum, I would recommend checking out our complete Robot vacuum Review page. Canister Vacuum – Canister vacuums have strong suction power, are generally just slightly lighter than a traditional upright, and can be wheeled around as you clean. The in-hand portion is light like a stick vacuum. The Miele and Dyson canister vacuum models are corded. 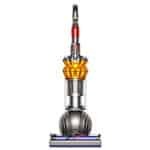 Depending on the exact type of vacuum you’re looking for, each brand seems to excel in different areas, as far as budget in concerned. For upright vacuums, Miele vacuums range from the $$ to $$$ tier. Dysons have a bit wider range, starting around the low $$ tier, but going towards the top of the $$$ tier. Stick vacuums, Miele only has only model which floats around the bottom of the $$ tier while Dyson offers five options, supplying a range from the bottom of $$ to the top top of $$$ tier. For robot vacuums, the Miele model is around the $$$ tier, while the Dyson comes in hot at the top of our $$$ category (arguably brekaing ground into a new $$$$ tier). Canister vacuums, the Miele range is at the top of the market, around $$$ to $$$$, while Dyson comes in closer to the top of $$ and ranging up to $$$. You want a cordless stick vacuum with a long run time? You’ll want to check out the Dyson V10. Want want a cordless vacuum with the smartest features? You definitely want the Dyson V11. You want the absolute best vacuum for hardwoods floors? The Miele Compact C1 can’t be beat. You want the power of an upright, but in a smaller size? Don’t miss the Dyson Animal Compact. You need something to remove pet hair? Dyson’s Animal 2 or the Miele Cat & Dog are both good choices. Depending on what exactly you’re looking for, a different model may be right or wrong for you. Our hope is that the comparisons above will help you narrow down your choices and break these two mega-brands into digestible segments. If you still can’t pick which one is right for you, send us an email here. We’d be happy to help you out. April 18, 2019 – Added the Dyson V11 recommendations to the mix. Updated and improved formatting to a number of areas.